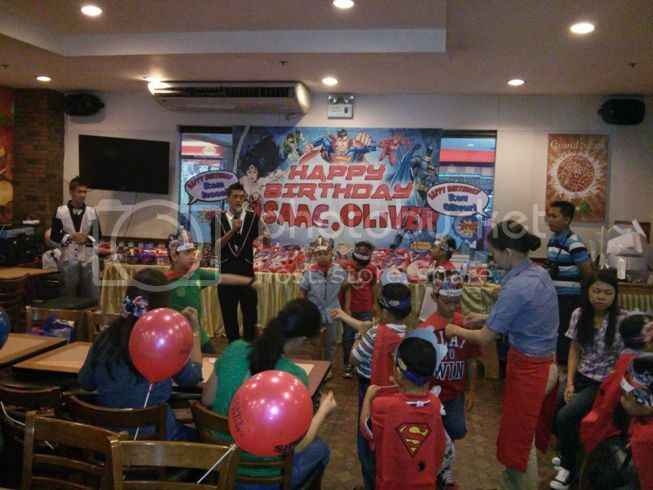 Justin and I have attended two kiddie parties held at different Shakey’s branches, one at Shaw Zentrum in Mandaluyong City and the other one at Katipunan, Quezon City. 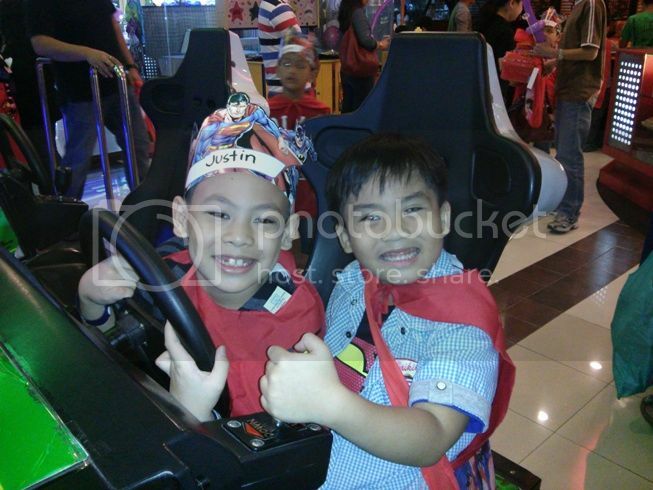 The birthday celebrators were Justin’s classmates, Ram and Diego. 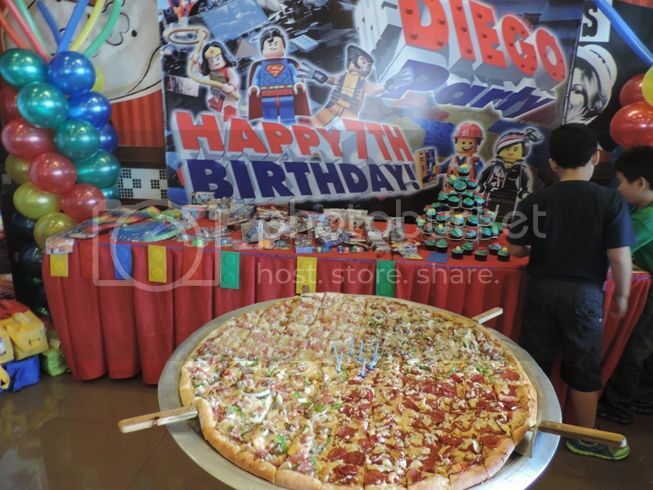 Ram celebrated his 7th birthday last February 23, while Diego had his birthday party last March 16. Justin said Ram is his third best friend. That’s the reason why he said we shouldn’t miss his 7th birthday party. 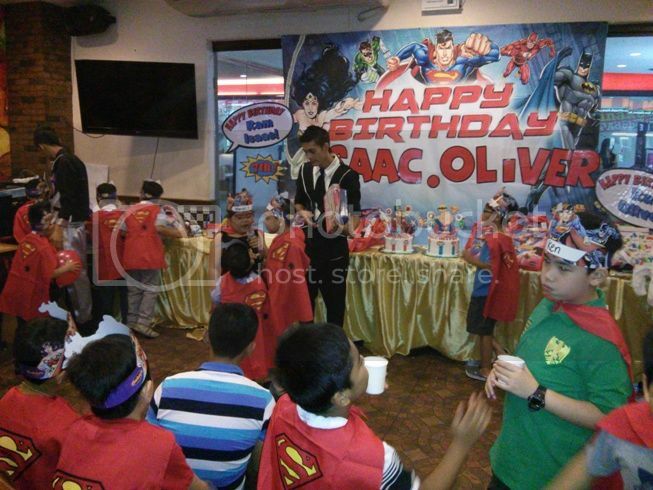 In keeping with the Justice League party theme, all the kids were given Superman capes to wear with matching Superman party hats. The guests loved the lively host who also performed magic tricks for everyone. He made the audience laugh because he was funny, and he had a great sense of humor. Despite being held early, Diego’s Lego-inspired party was held well-attended by his classmates because it’s already vacation time for the kids. This was where we got to see Shakey’s Giant Pizza, a 32-inch round pizza with approximately 121 square cuts that can feed 30 to 40 people. 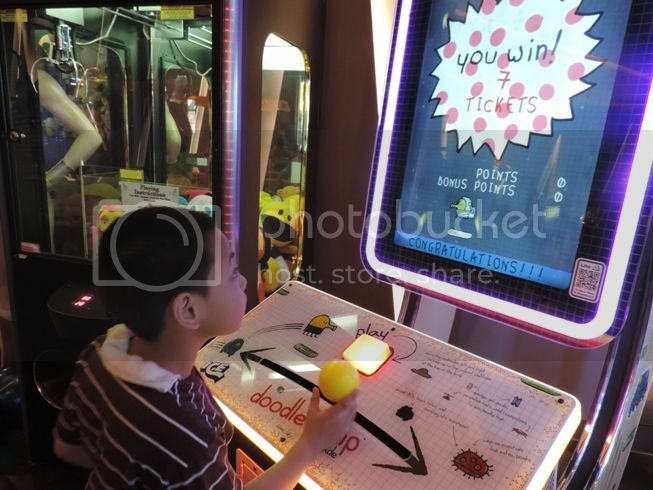 The kids likewise had a blast playing at Shakey’s Fun Zone (a mini arcade area) before, during and after the party. 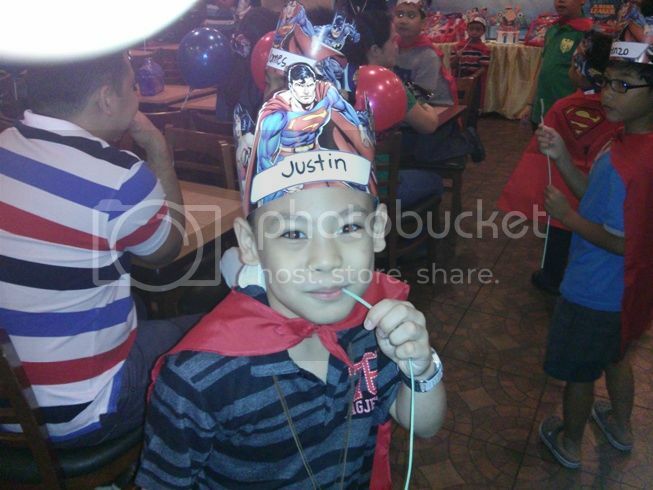 This was also one of the things that Justin really enjoyed at Ram’s birthday bash. We’re really glad we attended these two Shakey’s kiddie parties because we enjoyed the games, the food, the camaraderie, and yes, Fun Zone! 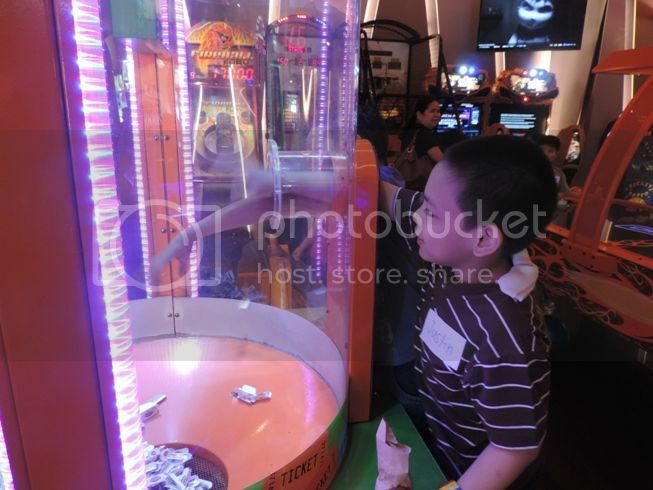 This entry was posted in Birthday Party, Shakey's, Shakey's Fun Zone, Shakey's Kiddie Party. Bookmark the permalink. Shakeys is one good party venue with funzone. Fun and food would surely delight the kids. 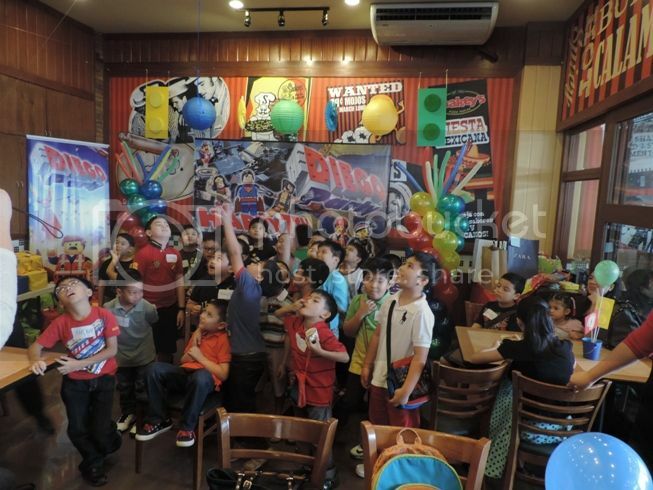 Looks a fun party for two kids…and at Shakeys. Really, very awesome to hold a party inside Shakeys. Looks fun. I never knew Shakey’s have these mini arcade activity area. I guess I never inquired that is why I never knew. Ang laki na ni Justin ano Ate Tess.. Looks so much fun! The foods are enough for party guests and the place’s good. look at that giant pizza!…i also prefer this pizza house…than the competitor. indeed a fun party for kids.. I love parties at Shakey’s. Ykaie had her first birthday there. ← Big Discounts, Raffle Prizes and Lively Performances at Super 8 Funfest 2014!